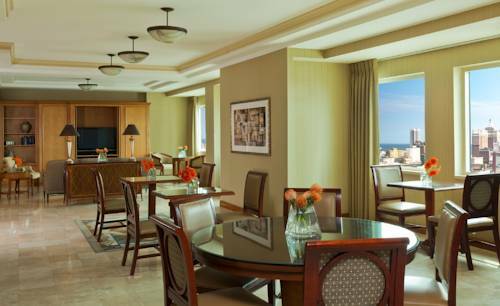 Work and play at Sheraton Atlantic City Convention Center Hotel, a vibrant destination nestled in the heart of downtown. Spacious accommodations, intuitive amenities and an ideal location adjacent to the Atlantic City Convention Center, the Boardwalk and Tanger Outlets make our hotel a favored choice among savvy travelers. Relax in our thoughtfully designed guest rooms and suites, boasting complimentary high-speed Wi-Fi, luxurious bedding and pristine marble bathrooms. Dine with us at one of several on-site restaurants, including Tun Tavern, an award-winning brewpub renowned for its craft beers and mouthwatering American fare. A wealth of on-site amenities are at your fingertips, including a 24-hour Sheraton Fitness Club and an indoor pool, while over 21,000 square feet of adaptable venue space renders our hotel a leading destination for weddings and meetings in downtown Atlantic City. Come chart your own adventure at Sheraton Atlantic City Convention Center Hotel we look forward to your visit. Tun Tavern: Stop by Tun Tavern to enjoy delicious dining and craft brews near the Atlantic City Convention Center. One of Atlantic City's most popular restaurants, Tun Tavern features award-winning steaks and other house specialties. Shoe Bar: Join friends and colleagues for cocktails and savory snacks at Shoe Bar, open daily for dinner in our hotel. Browse the memorabilia from past Miss America contests or watch a game on the large LCD screens. Boulevards Caf : Begin your morning in Atlantic City with an energizing breakfast at Boulevards Caf , our restaurant offering views of the Atlantic City skyline. Select from our extensive breakfast buffet, or order your favorites from our la carte menu.